We are a New Jersey based Non-Profit Organization. Our goal is to provide financial assistance to children with Cerebral Palsy and their families. Cerebral Palsy is the one of the most common neurological impairments in childhood. Our inspiration for Fight For Mike came from a young boy named Michael who has touched our lives. Michael was recently diagnosed with cerebral palsy, autism, among other disabilities. Fight for Mike is prepared to help children and families in need of financial assistance. Through both social and fundraising events, Fight For Mike raises awareness about Cerebral Palsy and how this disease effects so many people throughout the US & the world. Children with disabilities and their families deal with many challenges each day and Fight For Mike is well aware of the support these individuals require. member of Boiling Springs Savings Bank’s award winning Community Alliance Program! donations based upon our supporters’ designated accounts or new loans at Boiling Springs. No monies are withdrawn from your accounts and all donation dollars come directly from Boiling Springs. Supporters can help us earn money by opening new accounts or loans or by having an existing account at Boiling Springs and designating them as Community Alliance participants. Eligible Accounts are: CDs, IRAs, Checking Accounts, Savings Accounts, Money Market Accounts, and Premium Checking Accounts. Note: Business and Personal Alliance Checking products are a condition of our loan commitments, therefore Alliance Checking products cannot be designated as supporter accounts. 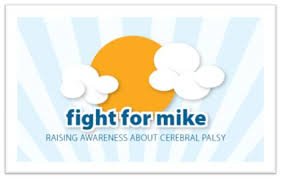 your account as a Fight for Mike, Children with Cerebral Palsy supporter by filling out the supporter account form and bring it to your local Boiling Springs office. 17 Offices in Bergen, Essex, Passaic and Morris Counties. Thank you for telling your friends, family, and co-workers about our organization. Fight For Mike cause..Become a corporate sponsor!